This glorious nut and dried fruit section is where I get a lot of inspiration for my recipes. 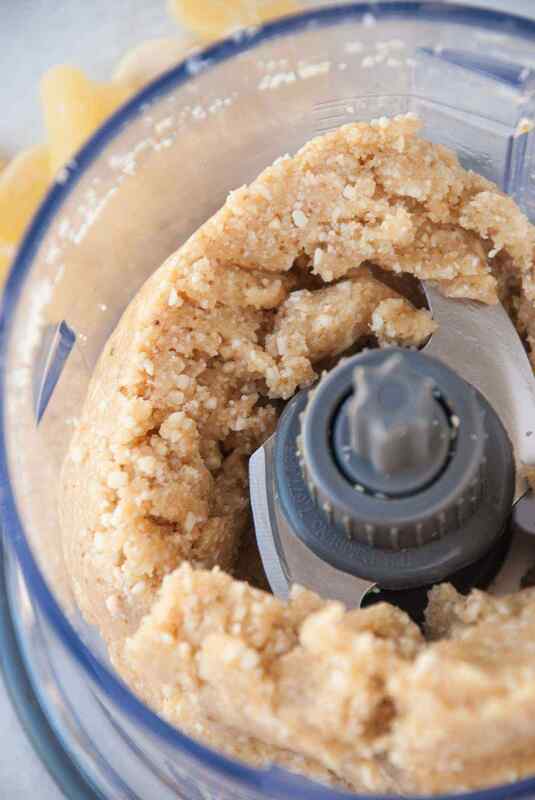 When making raw, nut based recipes, it’s easy to pick out a few things and toss them into a food processor and see what happens. My usual go to combo is almonds, dark chocolate and dates—simple and delicious! Today, while I was browsing through my favorite nut isles, I noticed dried pineapple (which I have never seen there before—trust me I would know because I am there ALL THE TIME). I clapped and squealed with joy—a dried fruit I haven’t worked with before. Finding a new ingredient is always an exciting moment for a food blogger! After I did a little dance, I quickly filled up a big bag of those juicy dried fruits, which by the way, tastes like candy! I must warn you, while shopping in the free nut section, never forget to write down the number associated with said nut. This will eliminate a lot of time (and embarrassment) at checkout and trust me, I’ve done this too many times to count—it’s not fun. 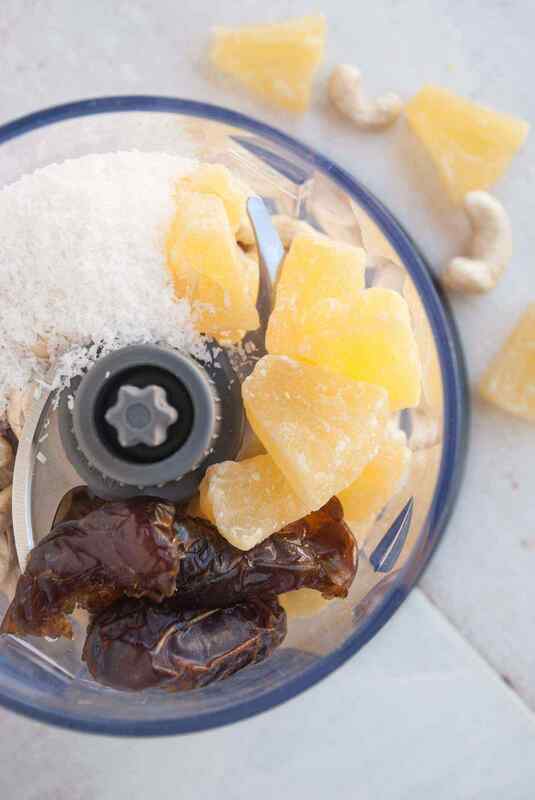 After I picked out the perfect nut to go best with my dried pineapple (spoiler, I chose cashews for their neutral taste), I could not wait to get home to test out some recipes. I forced my boyfriend to be my taste tester and while he was hesitant at first, he found himself rather enjoying my pineapple experiments. In fact, he even told me he thinks my pineapple cashew energy bites tastes like donuts. It was getting quite late and I think he was starting to get delirious. 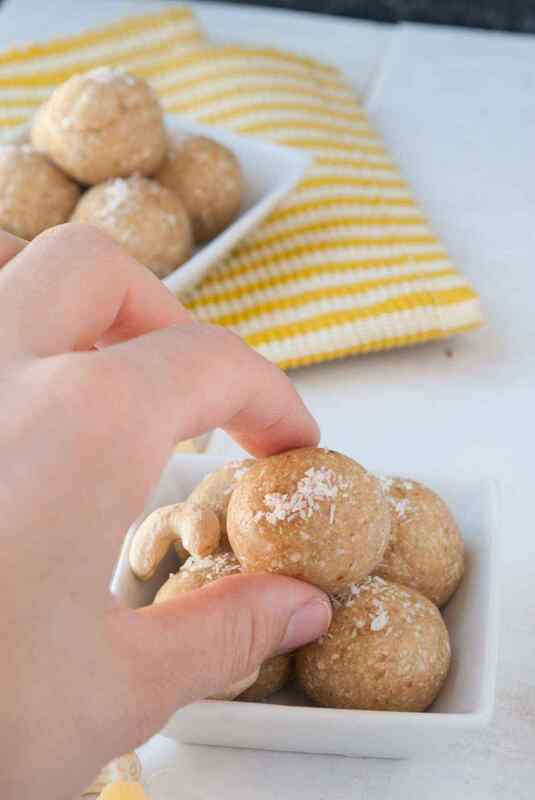 As delicious as donut flavored energy balls sound, these bites definitely do not taste like donuts. I’m okay with that because they taste like decadent, sweet, pineapple delights that are small enough to pop into your mouth on the go but packed full of fats and calories to keep you energized throughout the day—a perfect combination if I do say so myself!